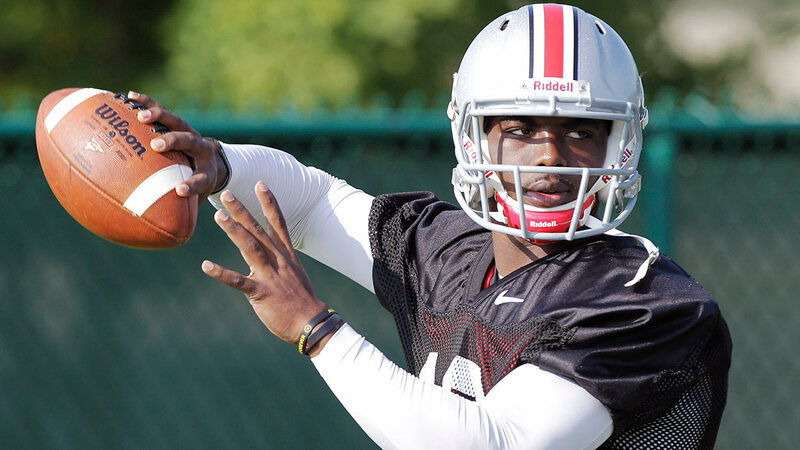 » Does Braxton Miller’s Season-Ending Injury Spell Doom for National Title Hopeful Ohio State? Does Braxton Miller’s Season-Ending Injury Spell Doom for National Title Hopeful Ohio State? It’s official: Ohio State quarterback Braxton Miller will miss the 2014 season after reinjuring his shoulder in practice, leaving the preseason no. 5 Buckeyes without their senior cornerstone and the most dynamic offensive weapon in the Big Ten. After winning 22 of 24 starts and accounting for more than 52 percent of OSU’s total offense over the past two seasons, Miller will presumably take a redshirt this fall and return in 2015 for his final year of eligibility. In the meantime, how will his absence affect Ohio State’s ambitions in the Big Ten, and in the national race at large? You have questions, we have answers. OK, technically that isn’t a question. But still: Miller has finished in the top 10 in Heisman voting each of the past two seasons, and it seems difficult to justify the Buckeyes’ status as legitimate playoff contenders with that kind of talent reduced to the spectator ranks. But let’s be fair to the new starter, J.T. Barrett, who didn’t just happen to wander from the intramural fields to the top of the depth chart. Despite missing his entire senior season with a torn ACL, Barrett was a well-regarded four-star prospect in the 2013 recruiting class. After redshirting last season, he has clearly separated himself from sophomore Cardale Jones, and he fits the same basic template as Miller: superb athlete, strong arm, accuracy could use some work. Size-wise, Ohio State lists Barrett at 6-foot-1, 225 pounds, only an inch and a couple of square meals off from Miller’s 6-foot-2, 215. Like Miller, who was thrown to the wolves as a true freshman following Terrelle Pryor’s protracted flameout in 2011, Barrett should only need a few starts to begin unlocking his potential. “Thrown to the Wolves?” In Other Words: DOOM! Actually, Barrett’s learning curve as a freshman shouldn’t be anywhere near as steep as Miller’s was, for three reasons. 1. Where Miller was as green as could be in 2011 — and often looked like it, completing just north of 50 percent of his passes en route to a 6-7 record — Barrett has already been on campus for more than a year,1 and has been groomed as the heir apparent from the moment he arrived. 2. Where Miller was forced to adjust on the fly to an offense in the throes of utter chaos following Jim Tressel’s resignation and suspensions for multiple starters, Barrett will step into a well-defined role in the same system he’s been absorbing for the past 18 months. 3. Unlike Miller, who spent the first half of his freshman season playing musical chairs with an immortal stiff, Joe Bauserman, every indication is that Barrett will have the job all to himself. If Jones takes a meaningful snap this season, something (else) will have gone very wrong. Which Brings Us Back to … DOOM! Yes, we’re beginning to catch on. Frankly, though, given Urban Meyer’s stellar track record with run-first quarterbacks,2 the most pressing concern remains the offensive line: Aside from junior left tackle Taylor Decker, the front five will feature new starters at each of the other four positions, only one of which (right guard, manned by sophomore Pat Elflein) appeared to be settled at the start of preseason camp. While that’s admittedly a problem, it’s not a new problem. Miller was set to operate behind the same line, whatever its composition. OK, fine. Let’s assume the worst: that the offense without its senior star spends the entire season trying to crawl out of a smoking crater on its own 19-yard line. There’s still the defense, which boasts arguably the nastiest line in the nation and expects to improve significantly after a (relatively) mediocre turn in 2013: Football Outsiders projects Ohio State to improve from 45th last year in Defensive F/+, its primary measure for defense, to 31st in 2014. More importantly, there is still this schedule, which, Braxton Miller or no Braxton Miller, presents only one obvious challenge to Ohio State’s supremacy in the Big Ten’s East Division: a November 8 trip to the defending conference champion, Michigan State. Clearly, Miller’s absence leaves the Spartans as the favorites to take the division, and knocks OSU from the ranks of presumptive playoff front-runners. Still, Ohio State’s biggest obstacles on paper are games against Virginia Tech on September 6, Penn State on October 25, and Michigan in the regular-season finale; none of those teams is ranked in the preseason polls, and all of them are dealing with deep-seated issues of their own. The best teams in the West Division (Nebraska, Wisconsin, Iowa, Northwestern) are conspicuously absent from Ohio State’s cross-division draw. Assuming Miller’s replacement meets the bare-minimum criteria for a starting Big Ten quarterback, it’s fair to say that Ohio State will still be favored to win at least 10 games against this particular slate. True, that says as much about the top-heavy reality of the conference as it does about Ohio State’s prospective resilience. And that reality is a very bad omen for OSU’s playoff ambitions unless it manages to run the table. With Miller at the controls, that was a strong possibility. Without him, it’s more likely the Buckeyes will drop a couple of games they shouldn’t and never be heard from in the playoff discussion. But unless Barrett is an unexpected, unmitigated disaster, the gap between Ohio State and the competition it definitely has to face will remain too large to bridge on a consistent basis. He enrolled early in 2013 to go through spring practice. Besides Miller, Meyer maximized the highly debatable talents of Alex Smith and Tim Tebow at Utah and Florida, respectively, and won a national championship in Gainesville with Chris Leak at the controls, for heaven’s sake. NFL Regression Party! Which Teams Will Disappoint Us This Year?